Beyond simply shaping research habits and practices, this population of middle and high school teachers suggests that the very definition of what “research” is has changed considerably in the digital world, and that change is reflected in how their students approach the task. The growing use and popularity of search engines among all segments of the population as a critical tool for finding information is reflected in today’s middle and high school students, who have not known a world without these tools. As a result, their very conception of “research” may be fundamentally different from prior generations. In focus group discussions, teachers framed prior generations’ research practices as a time-consuming process that involved formulating a clear research question and then seeking out relevant and accurate information from trusted sources (mainly libraries), often with the aid of an expert (such as a reference librarian). In contrast, many suggest that today’s students define and approach the process of “doing research” very differently. What was once a slow process that ideally included intellectual curiosity and discovery is becoming a faster-paced, short-term exercise aimed at locating just enough information to complete an assignment. Teachers noted that this trend is driven not only by the immediacy and ease of the online search process, but also the time constraints today’s students face in their lives more generally. Teachers’ perceptions that their students use only a handful of resources and rely mainly on search engines for their research are echoed in survey results. 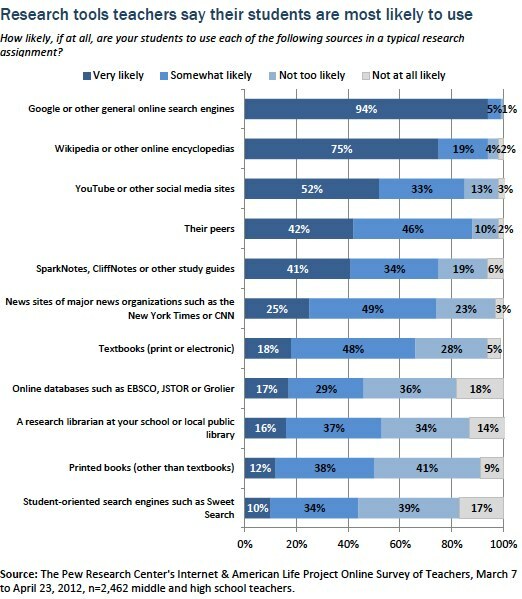 Asked how likely their students were to use a variety of different information sources for a typical research assignment, 94% of the teachers participating in the survey said their students were “very likely” to use Google or other online search engines, placing it well ahead of the other sources asked about. Second to search engines was the use of Wikipedia or other online encyclopedias, which 75% of teachers said their students were “very likely” to use in a typical research assignment. And rounding out the top three was YouTube or other social media sites, which about half of teachers (52%) said their students were “very likely” to use. 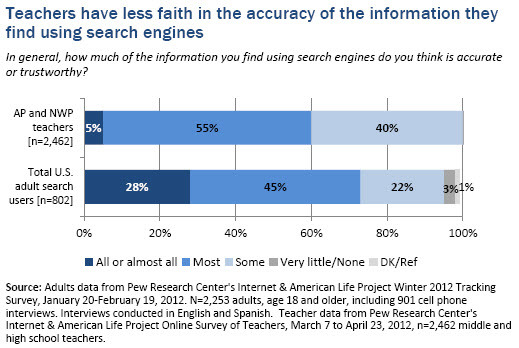 Virtually all subgroups of this sample of AP and NWP teachers reported similar levels of student use of search engines. The only exception to this pattern was among teachers of the lowest income students (those living below the poverty line); this group was slightly less inclined (at 90%) to say their students are “very likely” to use search engines in a typical research assignment. This group was also among the least likely to report their students are “very likely” to use Wikipedia and other online encyclopedias (68% compared with 75% of the total sample). In contrast, 80% of teachers whose students are described as mostly upper and upper middle income say their students are “very likely” to use sites like Wikipedia. The use of online encyclopedias as research tools also varied slightly by subject taught, with English teachers at the low end (69%) and science teachers at the high end (82%) of the range of those saying their students are “very likely” to use this source. English teachers are also the least likely to describe their students as “very likely” to use YouTube and other social media sites in a typical research assignment, with 44% reporting this level of use. The figure for the sample of teachers as a whole is slightly higher at 52%. More “traditional” sources of information, such as textbooks, print books, online databases, and research librarians ranked well below these newly emerging technologies. Fewer than one in five teachers said their students are “very likely” to use any of these sources in typical research assignments. In the case of online databases and printed books, half or more of the teachers who participated in the survey said their students are “not too likely” or “not at all likely” to use these sources. In fact, fewer teachers said their students are likely to use these sources than to use their peers, study guides such as SparkNotes or CliffNotes, or the websites of major news organizations. When it comes to the use of print books, the findings across all subgroups in this sample of teachers are surprisingly consistent. Teachers of the poorest students—those living below the poverty line—stand out slightly in that they most commonly say their students are “very likely” to use print books in their research assignments (19% say this). Also among the teacher subgroups particularly likely to say their students are “very likely” to use print books in research assignments are middle school teachers (19%) when compared with 9th-10th grade teachers (12%) and 11th-12th grade teachers (11%). At the other end of the range, science (7%) and math (9%) teachers are particularly unlikely to say print books are a common source for their students. Among the subgroups of this sample who are most inclined to say their students are “very likely” to use research librarians as a source are English teachers (20%) and teachers ages 55 and older (22%). But again, these figures are only slightly higher than the 16% of all teachers who say this is the case. In focus groups, teachers noted that students prefer the internet because they find it a more interesting and entertaining platform. While the internet is a “cool” place to do research, other more traditional sources are perceived as “boring” by students. The internet offers multi-media content, links to additional information, interactive formats, and textbooks and other print books pale in comparison. The trend among teens to equate finding information with “Googling” mirrors trends seen in adults over the past decade. Over time, Pew Internet’s surveys of adults have consistently shown that search engine use tops the list of most popular online activities, along with email. Currently, 91% of online adults use search engines to find information on the web, up from 84% in June 2004. On any given day online, 59% of those using the internet use search engines. 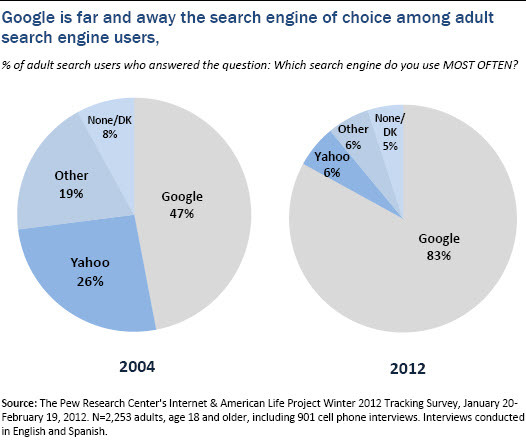 In 2004 that figure stood at just 30% of internet users.9 Moreover, among adult search users, Google is far and away the most used search engine with Yahoo placing a distant second, and its dominance is growing over time. The teachers in our sample are likewise part of the “Googling” trend. Asked about their own use of different online tools, 100% of the teachers participating in the survey said they use online search engines to find information online, with 90% naming Google as the search engine they use most often. 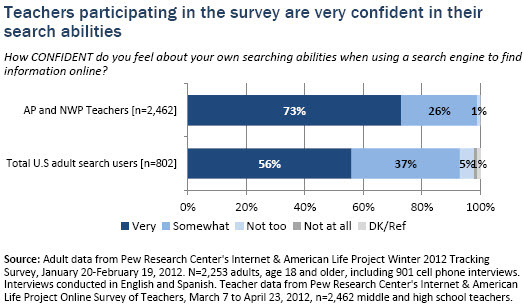 Overall, compared with all U.S. adults, this population of teachers is more confident in their own search abilities. Almost three-quarters (73%) of these middle and high school teachers say they are “very confident” in their own search abilities, with another 26% saying they are “somewhat confident.” Of the more than 2,000 teachers surveyed, only 1% describe themselves as “not too confident” when it comes to using search engines. While this sample of AP and NWP teachers has greater confidence than adults as a whole in their search abilities, they have considerably less faith in the accuracy of the information they find using these tools. Just 5% of teachers participating in the survey say that “all or almost all” of the information they find using search engines is accurate or trustworthy, compared with 28% of all U.S. adult search users. 50% of teachers ages 22-34 say that all or most of the information they find using search engines is accurate or trustworthy, compared with 61% of teachers ages 35-54 and 68% of teachers age 55 and older. Meanwhile, 80% of the youngest teachers say they are “very confident” in their search abilities, compared with 75% of 35-54 year-old teachers and 63% of teachers ages 55 and older.